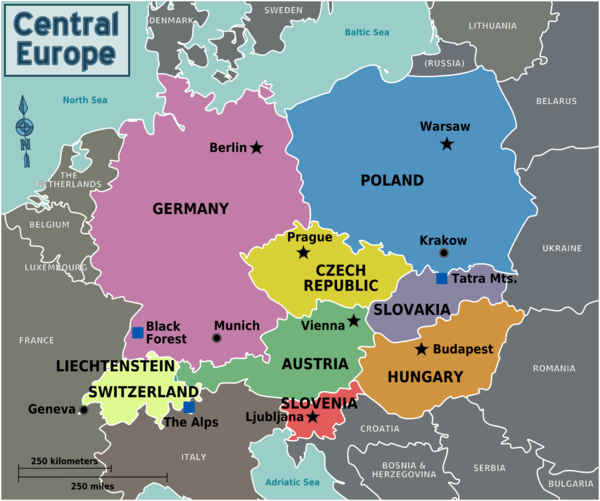 Central Europe is a region forming the heart of Europe. It includes Germany (also alternatively placed in Western Europe), the Visegrád countries (three West Slavic countries (the Czech Republic, Poland, and Slovakia) and Hungary), which became part of the EU in 2004, and sometimes Slovenia (though placed more commonly in southeast Europe). Only Switzerland and tiny Liechtenstein are not EU member states but share close economic and cultural ties with the region but also have stayed away largely for economic and historical reasons. It is a large and important region stretching from the Baltic Sea in the north to the Adriatic in the south. It is also home to some of Europe's and the world's most prosperous economies and cities. Lastly, it includes the fabled mountain range of the Alps which acts a transition zone between the Latin, Germanic and Slavic cultures which all call the region home. Interesting for its countryside, especially the Tatra Mountains, caves and castles. Often called the miniature Europe, it is on the crossroads of the Slavic, Germanic and the Romanic world. An economic powerhouse in the middle of Europe itself, it has idyllic landscapes and mountains alongside modern cities and the delightful mixture of three European cultures. Warsaw — the beautiful political and business centre of Poland with a completely re-built old-town and castle square following destruction from the second World War. In the summer, the Barbican archway is a busy thoroughfare, linking some of the prettiest streets in the city together. Castles appearing straight out of fairy tales dot the entire landscape of Central Europe. Pictured here is Schloss Neuschwanstein near Füssen, Germany. While ethnically different, the countries of Central Europe share a similar culture and history throughout the ages. Thee of the most important political units in the region were the Polish-Lithuanian Commonwealths and the German and Austro-Hungarian empires. They were preceded in the Middle Ages by the Holy Roman Empire, a patchwork of states and statelets whose extent varied over time. Ethnic conflict was a major problem for hundreds of years in Central Europe and culminated in the horrors of the Second World War. With the peaceful reunification of Germany and the recent expansion of the EU to encompass the former Warsaw Pact states in the region, this problem finally seems to have been solved. It is a common mistake by outsiders to label all Slavic or the former Warsaw Pact (also called the Eastern Bloc) states in the region as located in Eastern Europe. Almost uniformly, inhabitants of Central Europe will be flattered and pleased if you correctly describe their countries as "central European" both geographically and culturally. Conversely, they may be upset if you lapse into Cold War stereotypes. East and West Germany were countries, so better to call it eastern and western Germany. Reunification is all but a thing of the past and seen in a more or less positive light by most there and in all of Central Europe so try to avoid labeling Germans by their recent past. Remember Germans are Germans but Austrians, Liechtensteiners and most Swiss and Luxembourgers all speak German, but are not German! Czech, Polish, Slovak or Slovene may sound similar to Russian, but inhabitants of these countries will not take kindly to assumptions of cultural overlap. Lastly, keep in mind that the Czech Republic and Slovakia once shared a country as well and Slovaks in general are very proud of their new found independence. While they are not currently considered part of Central Europe, the regions of western Ukraine, Kaliningrad Oblast (Russia), Alsace and parts of Lorraine (France), and South Tyrol/Alto-Adige province (Italy), are sometimes also considered Central European. This is due either to their current and or past ethnic makeup and/or previous political histories. The Kaliningrad oblast spent most of its history as a German speaking region and South Tirol remains a largely German-speaking region in northern Italy maintaining strong cultural ties to Austria. Even though Ukraine is predominantly an orthodox country, its westernmost part for the centuries was part of the Polish-Lithuanian Commonwealth and later passed to Austria-Hungary which to some extent influenced it's unique culture. Central Europe, because of its rich heritage of nationalities, likewise is home to many languages. Some languages enjoy national status and thus are taught in schools and used widely in the media. Others however are only regional languages or minority languages and thus are sadly in danger of eventual extinction even though efforts are underway to try to preserve them. German has the largest number of native speakers in the region and acts as the single "official" language of Austria, Germany and Liechtenstein. In Switzerland, German is the mother tongue of 2/3 of the population and the dominant language of the four official Swiss languages (German, French, Italian & Romansh). There is a small German speaking minority to be found in Poland, Czech Republic and Hungary. It is also spoken outside Central Europe in eastern Belgium and France, and northern Italy (mainly in the region of South Tyrol/Alto Adige). German can be very diverse and appears in many different colorful dialects particular in the Southern German-speaking world (Southern Germany, Austria, Switzerland, Liechtenstein and South Tyrol) were tradition and dialect remains strong. Czech and Slovak are very closely related and are mutually intelligible. The Sorbian language(s) spoken in eastern Germany near the Polish frontier is also a close relative. Polish is the dominant language in all regions of Poland. Kashubian, a regional Slavonic language, is spoken in the region around Gdansk in Pomerania in northern Poland. Silesian is a regional language/dialect, (depending on who you ask) found in southwest Poland. Hungarian is one of the most difficult languages for other Europeans to learn, as it originates from a different language family and is related to Finnish and Estonian. There are 5 million Hungarian speakers living outside Hungary in neighbouring countries such as southwest Ukraine, Romania (Transylvania), northern Serbia, eastern Austria and central and southern Slovakia. French or Italian are spoken by the majority of the population in the southern and western regions of Switzerland, while Swiss German is commonly taught as a second language. French plays a historic role in alpine northern Italy in the French border regions. In the Swiss Canton of Graubünden or Grison, Romansh is spoken as a regional language. Almost all Romansh speakers speak either Swiss German and/or Italian as well. It is closely related to Ladino which is spoken in a few mountain valleys of northern Italy and is another endangered regional language. Sadly it is being replaced by German or Italian. Slovenian is the official language of Slovenia, but it is also spoken by the Slovenian minorities in northeastern Italy and wesreen Croatia. There is also a small Croatian minority in Austria's Burgenland. Sorbian, Frisian and Low German are Germany's three native minority languages with exception of Roma. Sorbian is related to Polish and Czech and can be found spoken in both the eastern states of Saxony and Brandenburg. All Sorbs speak German as well and the current Minister President (Governor) of the German federal-state of Saxony is even Sorbian! Frisian is related to English and Dutch and is spoken by tiny minority communities in Schleswig-Holstein and Niedersachsen and neighboring communities in the Netherlands. Lastly, Low German is spoken by rural communities or as a second language by a few in most federal states of northern Germany and still has a significant role to play in the city states of Bremen, Hamburg and Luebeck and in the states of Niedersachsen, Schleswig-Holstein and particular in the eastern federal-state of Mecklenburg-Western Pomerania. All three German minority languages are endangered languages. Efforts are underway to preserve the languages and their culture but it is seemingly a losing battle. Finding people who speak and understand English is not a problem in most regions of Central Europe, especially in Switzerland, Slovenia, Austria, Poland and Germany. In Slovakia, Hungary and the Czech Republic, English is widely spoken in the larger cities and by younger people; German and Russian are also spoken and understood by many older people in these countries. Russian, since the end of the Cold War and the unification of Europe is in steady decline. Today German remains important, more for financial and economic reasons instead of cultural or political reasons, as was the case in the past. Slovenians and the Swiss by far lead the region in their ability to speak many different tongues. Central Europe is very well connected within Europe and with the rest of the world. Germany, Austria and Switzerland are particularly renowned for efficient and fast transport infrastructures that make it possible to travel quickly to even the smallest villages usually by modern bus but sometimes even by train! The largest gateway for air travel is Frankfurt Main airport in central Germany, which offers connections to all continents and to most airports in Europe. Zurich, Munich, Vienna and Warsaw airports are a lot smaller but provide good connections to selected regional and intl. destinations. A difference between flag carriers and discount airlines is discount airlines may fly to an airport some distance from the city it serves. Flag carriers usually fly to nearby airports, such as Frankfurt/Main, while no-frill airlines like Ryanair fly to Frankfurt-Hahn airport, which is two hours away from Frankfurt city and actually closer to Trier. InterCityExpress (ICE) trains offer connections across Germany, but are also run in partnership with the Danish, Austrian and Dutch railways. The French TGV connects France with Geneva, Berne, Basel and Zurich. Also there are connections to Karlsruhe, Stuttgart and Frankfurt. RailJet conects Vienna with Zurich, Munich and Budapest. Prague, Brno with Vienna to Graz. Pendolinos are run in Slovenia and the Czech Republic with connections to neighboring countries. In addition, there are numerous night- and other express and regular trains that connect Central Europe with the rest of continental Europe, and travel as far as Istanbul or Moscow. Check the homepage of the Deutsche Bahn , which has an excellent overview of the European rail system. The motorways in Central Europe are excellent and offer fast connections across the region. The European Union has spent vast amounts of money to improve transport connectivity. Check individual country pages for details of routes and suggested itineraries. All of the countries located in Central Europe are now signatories to Schengen Agreement, which means that you can cross the borders unimpeded, save for random police checks. However as a visitor to the EU on a tourist visa you are limited to a 3-months total stay in all the countries in the region. Tour the Black Forest and maybe buy a cuckoo clock or just eat a torte! Visit the historic spa town of Karlovy Vary (Carlsbad) in Bohemia in the Czech Republic and "take the cure"
Experience the wild nightlife in Berlin, Prague, Munich and Budapest until the wee hours of the morning if you can! Beer -The golden beer drunk throughout the world was developed in this region, and arguably it is here that it is still at its best. The Czech Republic has a grand brewing heritage and Pilsen is the place were the technique was pioneered, creating the Pilsner style that is reproduced around the world. The low cost of beer in the Czech Republic makes it easy to get a taste of many of the fabulous beers, from the well known Pilsner Urquell, Budvar (Budweiser) and Staropramen, to local favourites such as Kozel, Bernard and Gambrinus. Many have a few different varieties and a Cerny Pivo (Black Beer) these can be as good if not better than the standard beer. Slovakia has many beers of high quality with Zlaty Bazant being highly regarded. Hungary, Poland, and Slovenia all have very good national examples sometimes on a par with those from the Czech lands. Germany, Austria and Switzerland have a similar brewing heritage, but can throw in several different types of beer. Weissbier, (Wheat Beer) is a refreshing style popular in summer but drunk year round. There are a huge amount of varieties and local specialities are nearly always worth seeking out. Generally, the further north one travels in Germany, the more bitter or hoppy the beer becomes adding to the north-south cultural divide. Bavaria, "the Holy Grail of Brewing", located in southern Germany, has over 600 breweries alone and even more accompanying beers to sample! Wine- The region produces a wide range of wines from superb world famous regions, down to inexpensive local plonk. Possibly the finest region in the area is Tokaj, world-renowned for its sweet dessert wines as well as more standard whites. Germany has several wine regions the Rhine, and Moselle Valleys are well known for their fragrant white wines. Saxony in the east even is home to a small wine growing region on the riverbanks of the Elbe. Austria and Switzerland also produce some very high quality products. In the other countries like Czechia, Poland, Slovakia, Hungary, and Slovenia local wines can throw up some very good varieties and it is always worth investigating local produce. Vodka- A Polish speciality, the quality of Polish vodka is amongst, if not the, best in the world. The high quality product can be very different to the industrial stuff you may buy in your local shop and is well worth a try. Zubrowka is a variety of vodka flavoured with a cinnamon-like grass and is delicious when combined with apple juice. Some claim it to be so good it produces no hangover! This page was last edited on 14 September 2018, at 03:57.